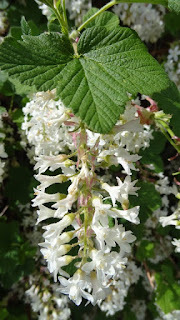 Plant namers are fond of the word spring and I have used it a number of times myself. 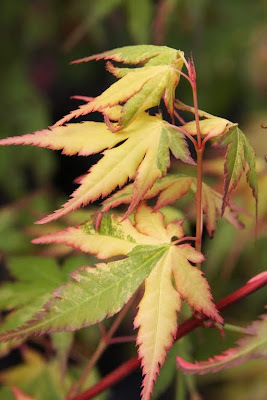 It's an appropriate adjective because many plants “do their thing” in spring by producing fresh lively foliage or blossoms that people love to see in their early gardens. 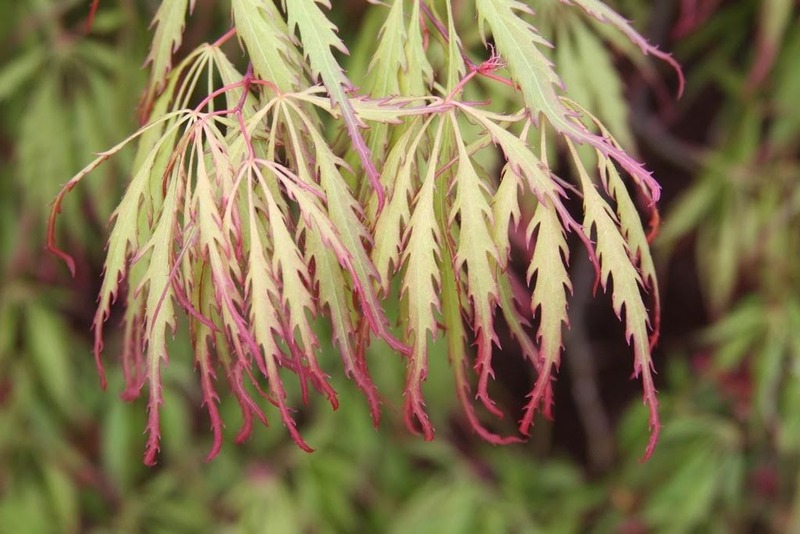 There are a number of green laceleaf maples in the trade, but one of my favorites is Acer palmatum 'Spring Delight', and largely because the fresh yellowish-green new growth is edged with red. 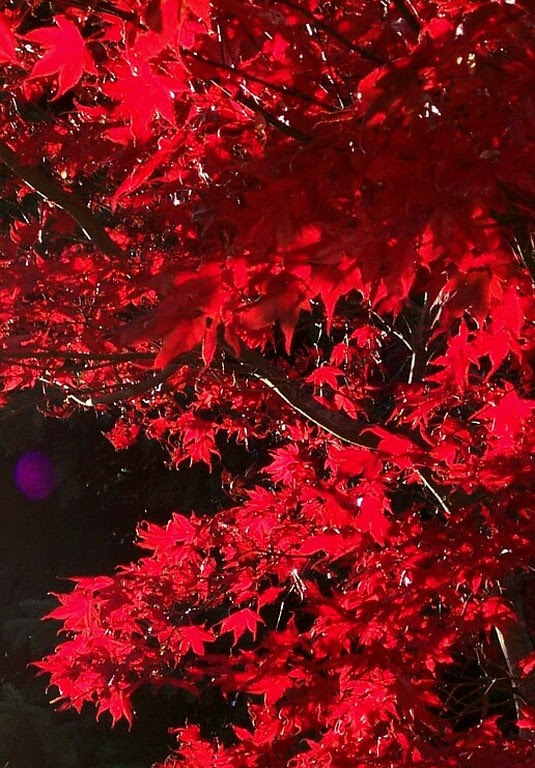 As the season progresses the foliage darkens to green and the red margin is not so evident, but still it's as nice as any other green laceleaf. 'Spring Delight' originated as a seedling at Buchholz Nursery but I don't have any record of the parent tree. It was at least ten years old when a visitor admired it and wanted to buy it. For some reason I said it wasn't for sale, but that event prompted me to propagate and name it, and I sold the first grafts in about 1998. The original tree was planted in the Display Garden, and I see it every day when I look out the office window. 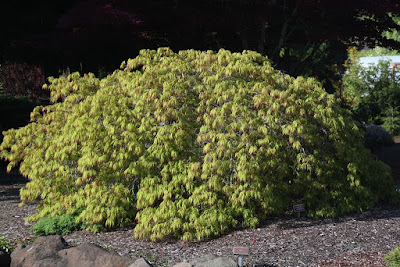 I have sold a couple of thousand I suppose in the past twenty years, mostly as one-year grafts, even though as a named cultivar its origin seems most accidental. 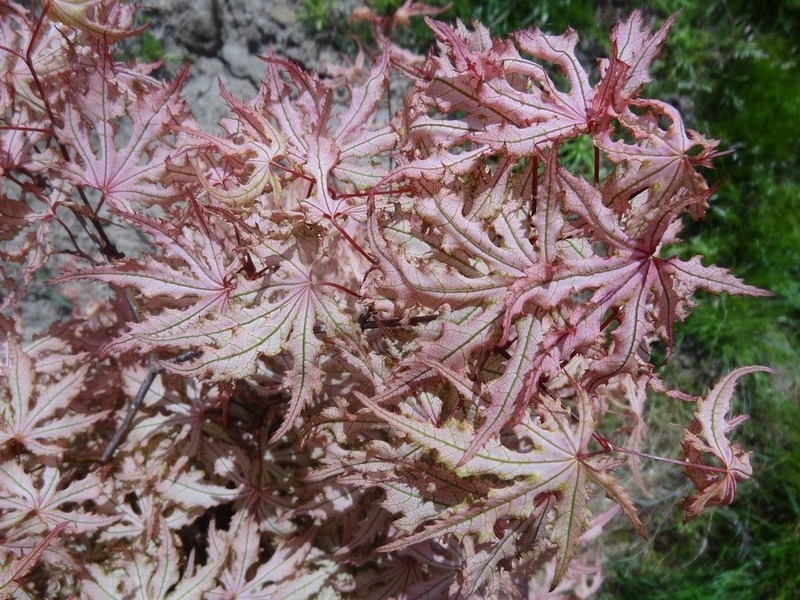 Acer palmatum 'Strawberry Spring' was selected from a group of seedlings with 'Amber Ghost' as the mother tree. 'Amber Ghost' is the strongest grower with the best canopy-shape of all from the original “Ghost” series, and about 100 of its offspring were planted out in full sun in the “real world” at Flora Farm. 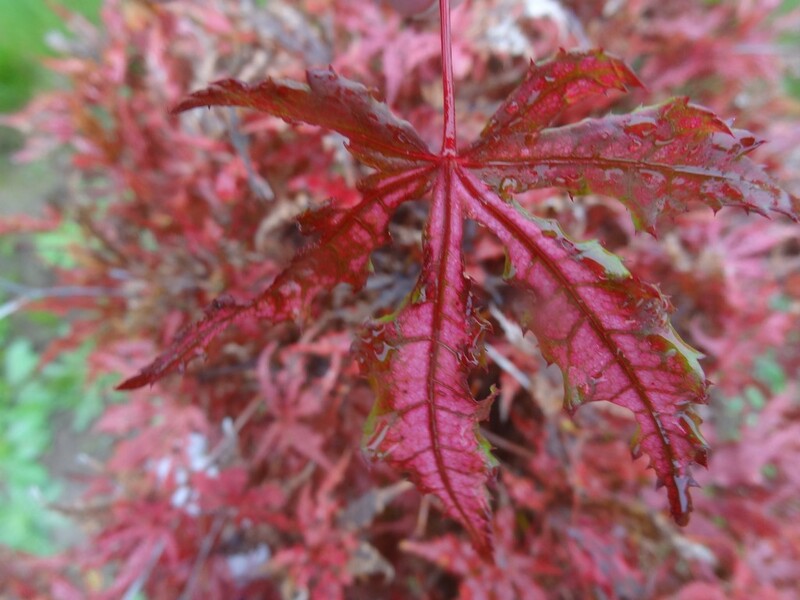 Every spring I would admire one's happy foliage, even though the original seedling grew as a runt compared to most of the others. As a grafted plant, however, the propagules grow as vigorously and with as good a shape as its 'Amber Ghost' parent. I've mentioned a number of times that an original seedling's growth characteristics are of no importance when describing a cultivar crop, and I now have a vigorous group of 'Strawberry Spring' stock plants that are twice as large as the original seedling. Many cultivars of Japanese maples feature purple-red foliage, and they are judged by how well they “hold” that color in the heat of deep summer. The world doesn't really need an Acer palmatum 'Red Emperor' if we also have Acer palmatum 'Bloodgood', but oh well, we have both. Why would we need an Acer palmatum 'Inaba shidare' if we already have Acer palmatum 'Tamuke yama'? 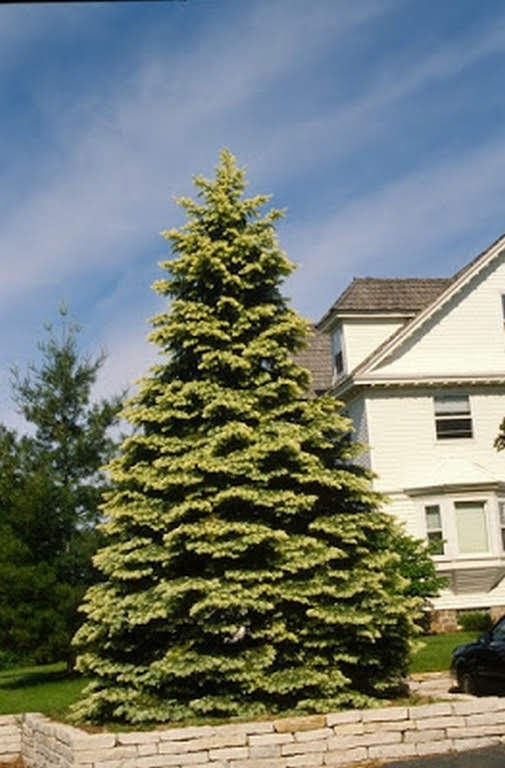 The answer is that one might perform better than the other in certain climates or garden situations. 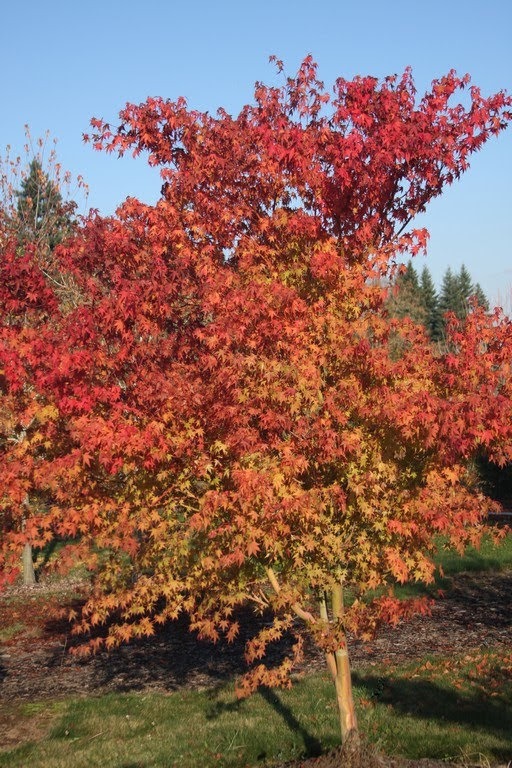 Still, there are way too many cultivars that resemble each other, and maple aficionados such as myself are responsible for the cultivar glut. Because one can tire of the purple-red selections, some of us feel attracted to different kinds of red, like brown-red, orange-red, or what I call: plum-red. 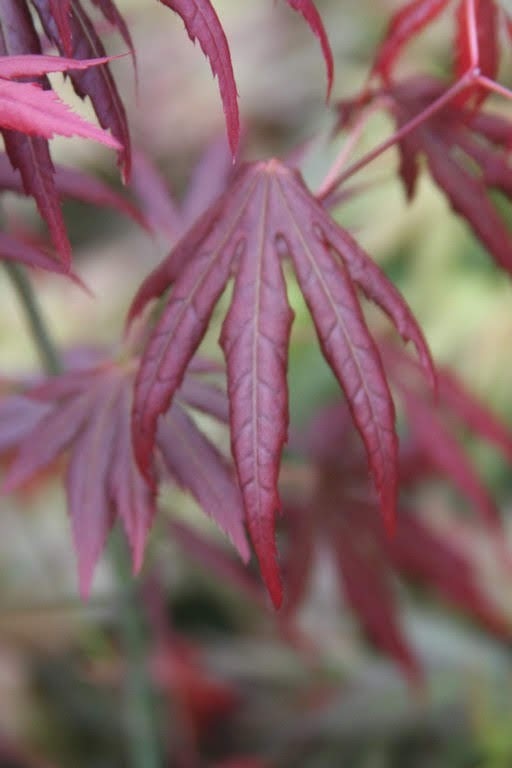 Acer palmatum 'Spring Plum' has a delicious foliage color, and you're tempted to drop a few of the burgundy leaves into a glass of pinot noir while you sip and read this blog. 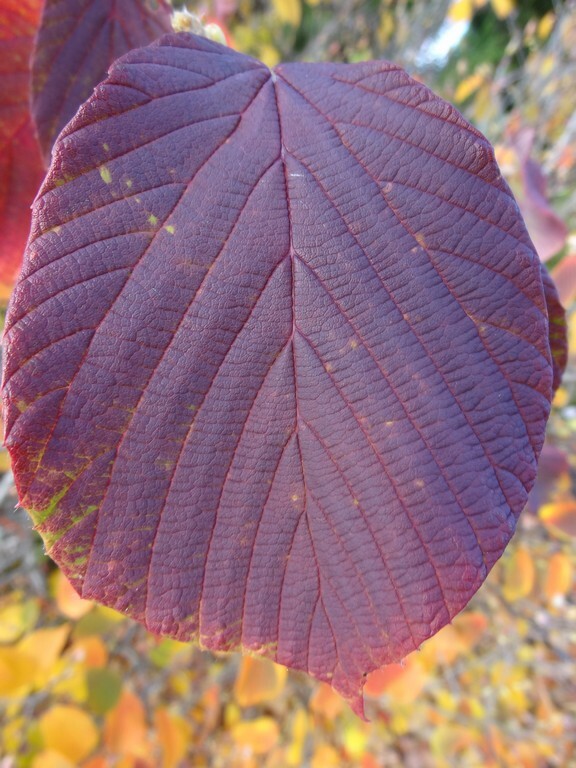 Also attractive are the lime-green veins which appear on the young plum-red leaves. 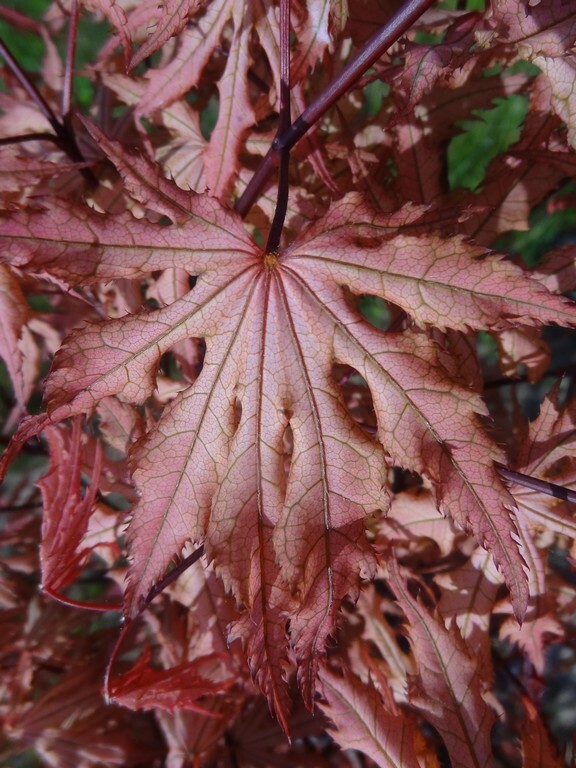 The original seedling – from a 'Purple Ghost' mother tree – always looked spectacular in spring, but it wasn't a very strong grower, and worst of all was that many of the leaves would defoliate by August. But as I mentioned earlier (with 'Strawberry Spring') the growth habit and/or problems of the original seedling might not be apparent with a grafted crop, and indeed 'Spring Plum' grafts have impressed us with their vigor and retention of leaves throughout summer. The Rite of Spring (French Le Sacre du Printemps and in Russian Vesna Svyashchennaya for “sacred spring”) is a ballet and orchestral work by Russian composer Igor Stravinsky. 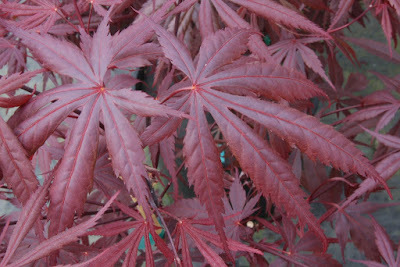 It is also a red palmatum upright that is particularly vibrant in spring, followed by brilliant scarlet autumn foliage. I describe the emerging foliage of maple cultivars as wildly different from the norm, same as with Stravinsky's music. This weekend I walked through four greenhouses of one-gallons that contain hundreds of named varieties – the colors mind-boggling and other-worldly. Reaction to the Rite of Spring music was usually intense, both pro and con, with composer Edgard Varese feeling “drawn to the cruel harmonies and stimulating rhythms.” Composer Julius Harrison said the Rite demonstrated Stravinsky's “abhorrence of everything for which music has stood these many centuries...all human endeavor and progress are being swept aside to make room for hideous sounds...” And some would feel the same about the visual overload of my maple cultivars. Has Buchholz gone nuts with hideous colors? 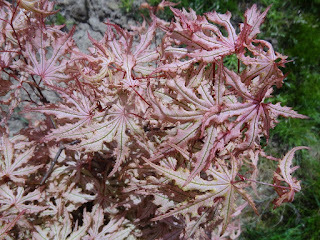 A pretty maple seedling germinated here and it impressed many with its cream-white variegation on otherwise green leaves. Peculiarly it originated as an offspring from a Japanese maple from the “Ghost series” even though it was totally different from any of them. 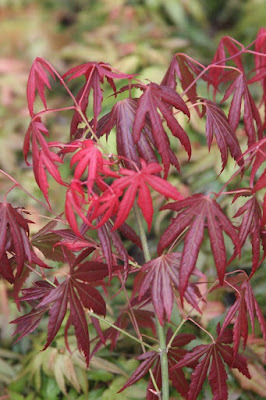 That illustrates the great fun that can be had here: that in an open-garden setting one maple can befriend another and produce seedlings that result in various Toms, Dicks and Harrys. 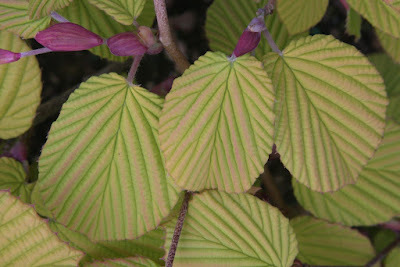 The vigorous variegated seedling was christened 'Spring Surprise' and early propagation proved successful. Unfortunately the next-generation plants grew lustfully but the variegation virtually disappeared. 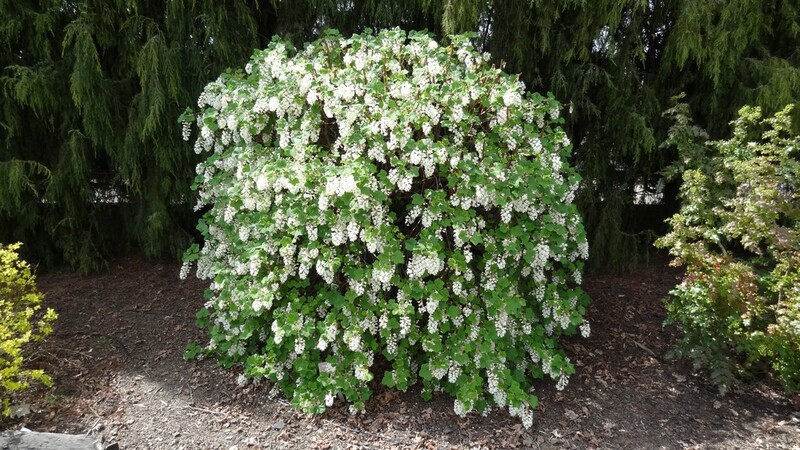 I planted the original at Flora Farm and the variegation on it is very sparse. So, what I have now is a “cultivar” that flashed-in-the-pan but didn't work out. Worst of all is that I don't remember if I sold or gave away any of the dud...but then in someone else's garden it might grow spectacularly variegated. 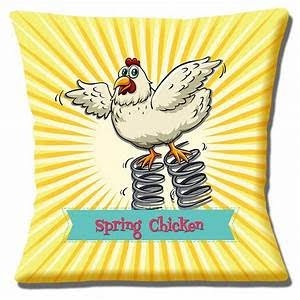 So, all of my “springs” have been good, worthy selections, with the exception of 'Spring Surprise'. 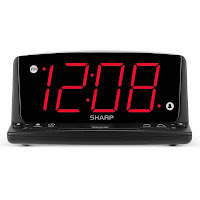 A few customers still wonder about the surprise, like when will I have it available again? Like I said, one specimen was planted at Flora Farm, while the remainder of the non-stable – for me – stock was converted to rootstock. 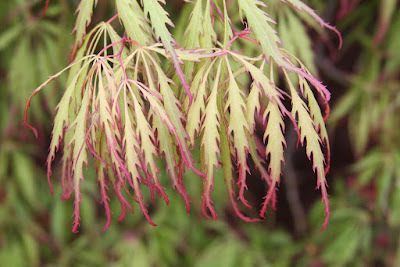 We grafted Acer palmatum 'Hana matoi' at about 8' into the top branches of the useless 'Spring Surprises'. They do the same thing with apple orchards. 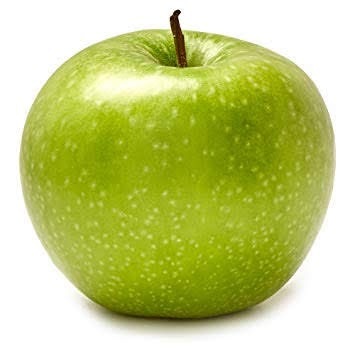 For example, if Granny Smith is no longer in favor, you can top graft Gravenstein or Braeburn and you will achieve a harvestable crop of the latter in three or four years by borrowing the hefty trunk and the roots of the old Granny Smith. Question: What did Granny Smith say to Mr. Gravenstein? Answer: Can't say – it's incider information. Ok, another question: If an apple a day keeps the doctor away, what does an onion do? Another question: Why did the boy choose the apple over the pear? Answer: He liked the apple butter. 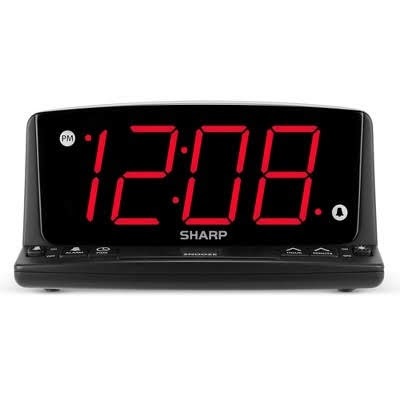 I won't, but believe me that I could go on and on, for I have a bushel-load of funny apple jokes. Oh, one more then – Question: What's the best thing to put into an apple pie? Ok, stop me – no more! Before any of the maples mentioned above were named and introduced, my first “spring” name was for Picea pungens 'Spring Ghost', a selection of Colorado blue spruce that was discovered in a landscape in Minnesota. Gordon Bailey Sr. approached me about 36 years ago to see if I would be interested to custom propagate a tree that he described as having the most incredible spring flush that he had ever seen. I requested a photo which he sent the following spring and I was on board with 200 grafts propagated that winter. Unfortunately only one-half of the grafts took, and some of them only shot a bud or two of sideways growth. 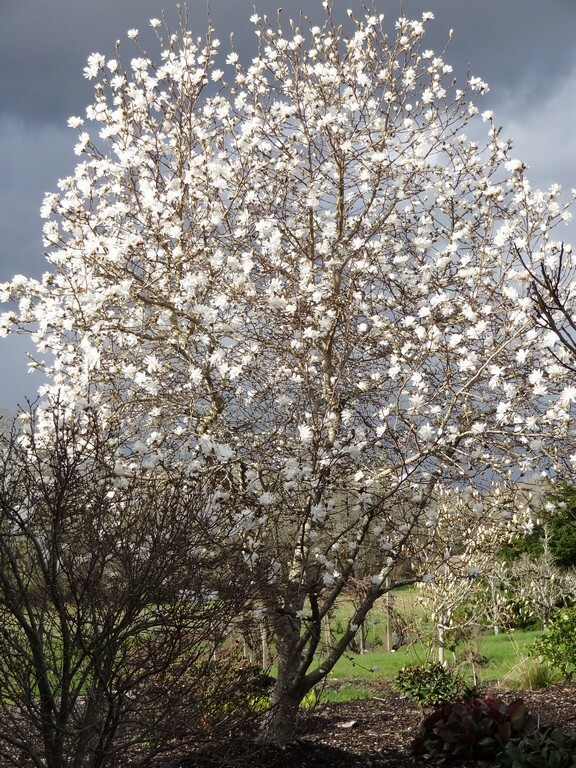 After a couple of years of poor results – when great results were attained on other cultivars – I realized that 'Spring Ghost' was not going to make me wealthy. 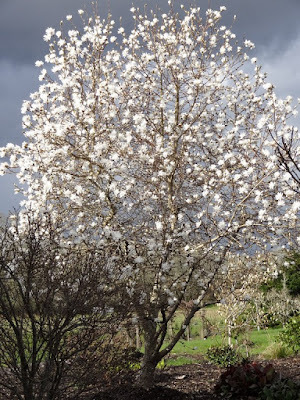 The early grafts didn't shape up into a nice full tree, and besides in summer the new cream-white shoots would burn in full sun. One ex-employee wagged “Spring Ghost, Summer Toast,” at least in Oregon, but in more humid Minnesota it grows much stronger. To my knowledge, no one is currently growing it in commercial numbers. 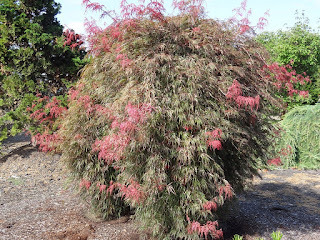 At its best it is a spectacular cultivar and I continue to keep a dozen or so at all times at the nursery. 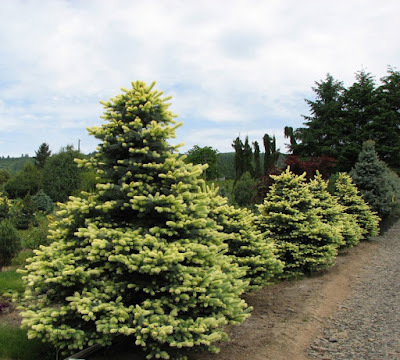 Other spruce cultivars are similar (with the attractive new growth) and much better production items, such as Picea pungens 'Gebelle's Golden Spring' and Picea glauca 'Mac Gold' (AKA 'McConnell's Gold'). 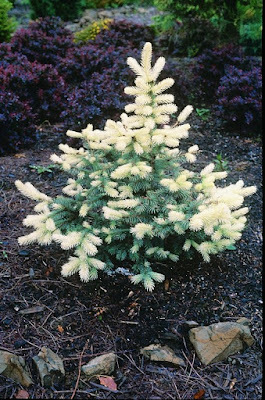 Actually it's not rare for a spruce to produce cream-white or golden new growth...which later hardens to blue or blue-green foliage. 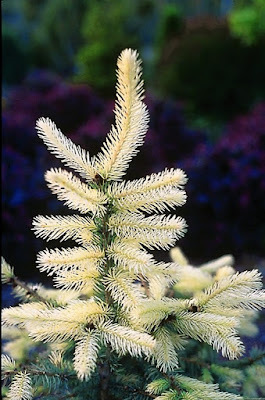 Another improvement over the burning 'Spring Ghost' is Picea pungens 'Spring Blast' and it is probably the most blue of the cultivars. It was discovered at another nursery from a crop of about 5,000 seedling-grown Colorado blue spruce – it couldn't be missed – and I named and introduced it in about 1990. A sister seedling from that crop displayed subtle pale-yellow new growth but it wasn't as vibrant. 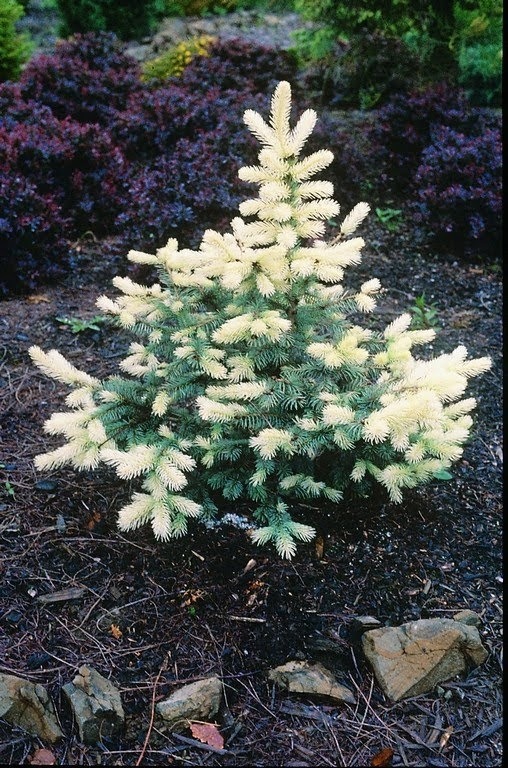 It might still be in the trade as Picea pungens 'Mellow', but I haven't propagated any in the past 10-15 years and I doubt that I even have one left in the collection. 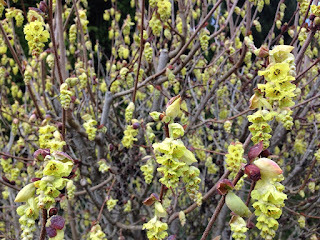 Another 'Golden Spring' is Corylopsis spicata 'Golden Spring', but unfortunately it also goes by the cultivar name 'Aurea' which can't be valid. 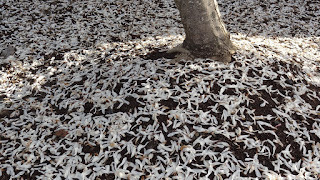 It was discovered in Gifu Prefecture, Japan by Seiju Yamaguchi and was patented by the bankrupt Hines Nursery Inc. of Irvine, California. I guess I never understood the politics or legalities of the patent, but since I only propagate in small numbers I don't really care about the details. Anyway the selection is very colorful but requires thoughtful siting, usually in rich, well-drained soil with PM shade. In deep shade it is more green, but in full sun in Oregon it will scorch. 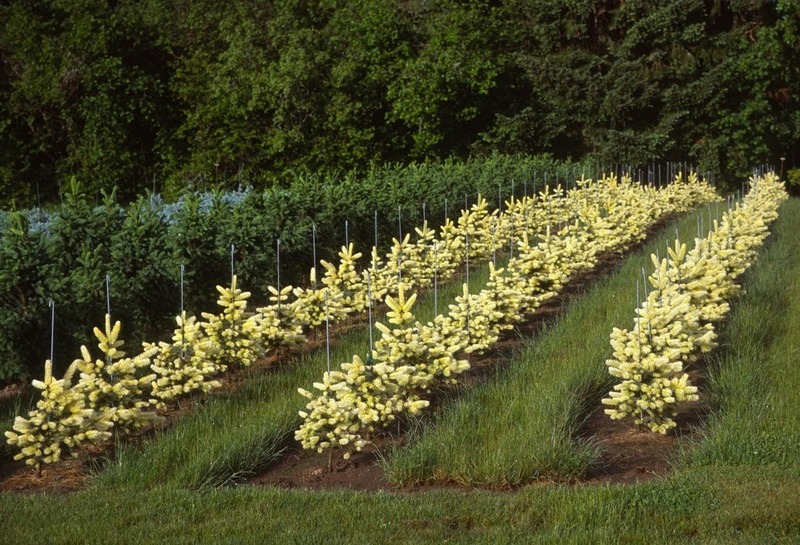 The “golden spike winterhazel” blooms in March for us, profusely, before the leaves appear, but it's the rich golden-to-butterscotch foliage that draws my attention, and I can easily rank it into my top ten of favorite shrubs. The winter-hazel Corylopsis willmottiae 'Spring Purple' is another favorite, and it is aptly named for its lustrous, deep-purple leaves that soon follow the precocious spring bloom event. 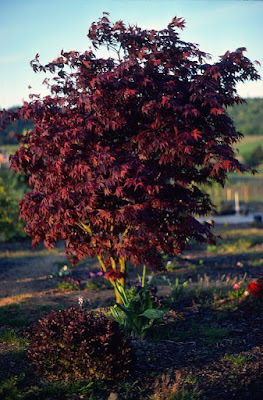 The leaves eventually evolve to green as the season progresses, and though the type displays early purple foliage, 'Spring Purple' is simply a more-exaggerated version. In my experience all of the Corylopsis possess dubious nomenclature – I'm certainly no expert – so I wonder if 'Spring Purple' is of the species spicata or of the species willmottiae. Is it perhaps a hybrid? 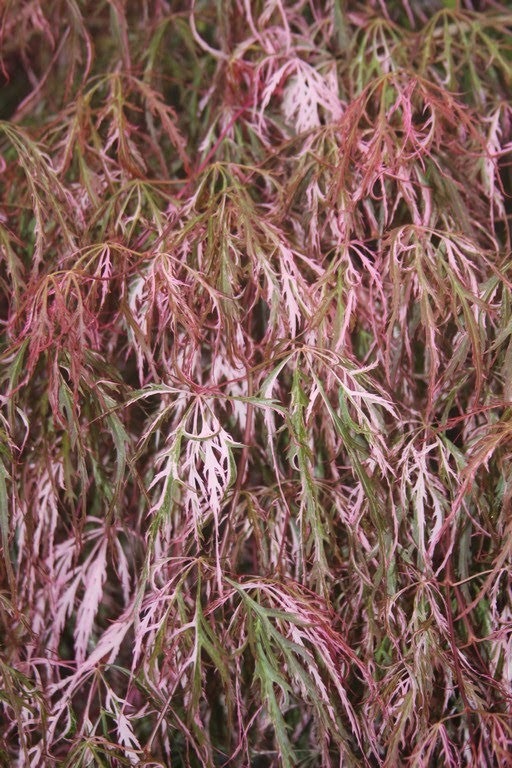 I've also seen it described as C. sinensis...so what then? 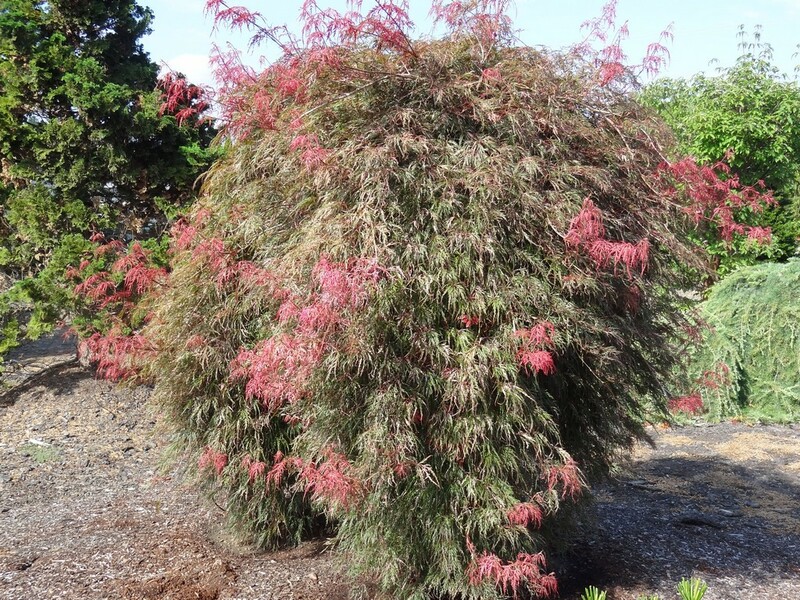 – spicata, sinensis, willmottiae or a combination of the above? I don't know...and I suppose that I'll never know. Remember one thing: that botanical classification is a human endeavor, and that it is not a requisite of the natural world. Nature, and its Kingdoms of Life, don't care or arrange themselves to fit into the cubbyholes of horticultural or botanical convenience. I've never been certain about Magnolia classification either. 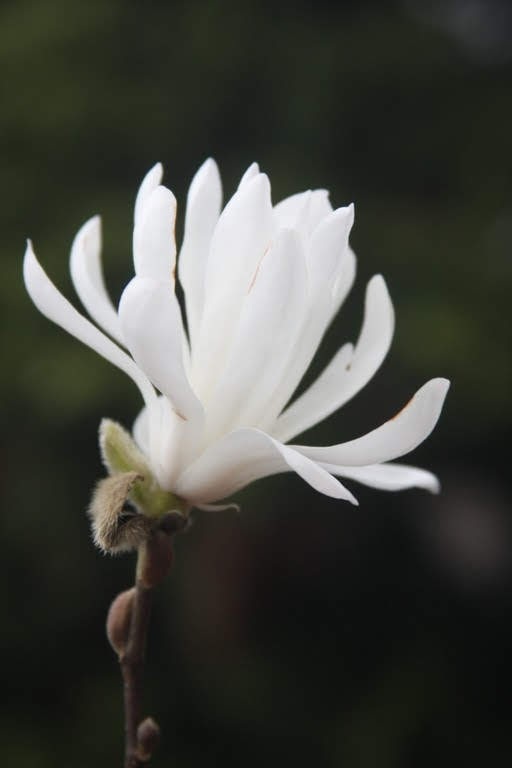 In our Master Plant List – our bible of correct spelling and nomenclature, we hope – we list Magnolia kobus var. 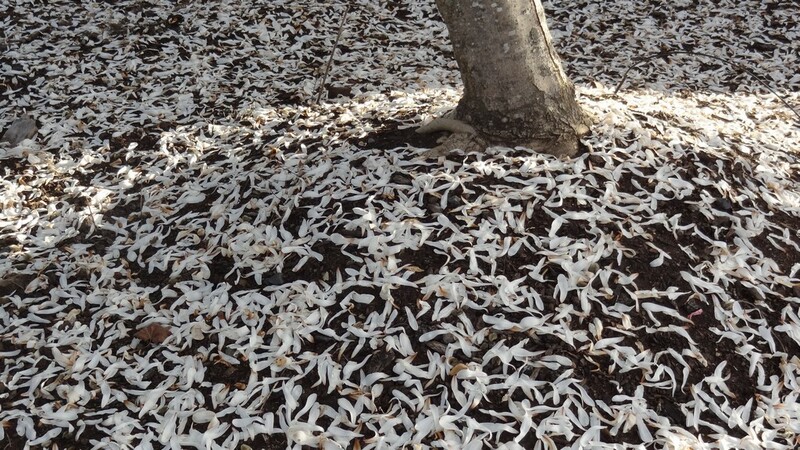 loebneri 'Spring Snow'. In Magnolias, A Gardener's Guide by Jim Gardiner, it is listed as Magnolia x loebneri 'Spring Snow', with the hybrid being M. kobus and M. stellata. The name loebneri honors Max Loebner who was working in Germany over 100 years ago with Magnolia development. Of course, chance hybrids have appeared in various gardens around the world in the meantime. 'Spring Snow' was selected by Professor Joe McDaniel of the University of Illinois and registered in 1970. 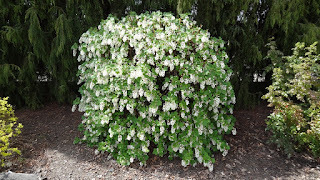 At first I assumed that it received its cultivar name due to a preponderance of white tepals which litter the ground just after flowering, but in fact it occurred at flowering which often coincides with the last spring snow of the year in Illinois. In any case, great name. Another 'Spring Snow' is the “Flowering currant,” Ribes sanguineum, an easy-to-grow deciduous shrub that blooms in dangling white racemes in March (in Oregon). It's tempting to bring a bouquet into the house to cheer things up, but in less than an hour you'll throw them out for their disagreeable smell. The generic name is from Medieval Latin for “currant,” and that – surprisingly – from Arabic ribas for “rhubarb.” The specific name sanguineum refers to “blood” or “blood-red,” and the species was first discovered by Archibald Menzies in 1793. Menzies (1754-1842) was a Scottish surgeon, botanist and naturalist who visited western North America on the Vancouver Expedition. Of course our native “Douglas fir,” Pseudotsuga menziesii was named in his honor, and I can show you in our local woods where Menzies's fir and the Ribes sanguineum grow among each other, and not far away you'll also find the “Pacific madrone,” Arbutus menziesii. It's easier to spring out of bed now in April with the morning light than it was last winter in the cold and dark. Frogs were croaking and the birds were singing this morning which helps inspire this old geezer. After all, I'm not a spring chicken anymore.